Iwan Roberts says his former Norwich City team-mate Malky Mackay would be a good choice to manage the club in the Championship. The Canaries are all but relegated from the Premier League after Sunderland's win over West Brom on Wednesday. 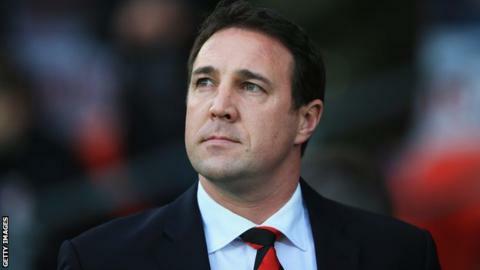 Mackay, 42, led Cardiff to promotion from the Championship last season, but was sacked in December. "I think he'd be a very good candidate. He knows the club, the owners and the area," Roberts told BBC Sport. Mackay and Roberts played together at Norwich for six years but both left the club after winning promotion to the Premier League in 2004. Scot Mackay, who started his managerial career at Watford, was sacked by Cardiff seven months after taking them up, with the club a point above the drop-zone. The Bluebirds have gone on to be relegated and will join Norwich in the second tier next season. "He has good experience in the Championship," said Roberts. "He knows what it takes to get out of the division. "And he won't stand for any nonsense. He won't be far off the top of the list." Sunderland's midweek victory means Norwich can only survive if they beat Arsenal on Sunday, West Brom lose to Stoke City and there is a 17-goal swing in favour of the Canaries. Former player and youth team coach Neil Adams is currently in charge of the side, having replaced Chris Hughton last month, and has taken one point from games against Fulham, Liverpool, Manchester United and Chelsea. But while Adams was named as full-time manager, the club have not committed to the ex-Canaries winger for next season. "I think the club needs a fresh face; someone who won't stand for any nonsense or egos," said Roberts, who is Norwich's third-highest all-time goalscorer, finding the net 97 times between 1997 and 2004. "Neil is a great lad put into a very hard situation. The performances have been better. But I do think Neil is better going back to the under-21s and getting a bit more experience with them." And Roberts says the board at Carrow Road must share the responsibility of relegation with former boss Hughton. "I think it has to go higher. Chris is employed by the football club. I suppose they showed him too much loyalty towards the end," he said. "The directors wanted to give him as much time as they could to turn it around, but he just wasn't going to do that. "And then when they did do it, it was the wrong time."